To explain it simply, colour temperature is the colour of light. It is measured in Kelvin degrees (K), which is a temperature scale like Celsius or Fahrenheit. How is Colour temperature measured? A special kind of metal is heated. As it is heated, it goes through every colour. When it becomes the same colour as the light, the temperature of the metal is measured. As a result, we get the colour temperature of that light colour. When the metal gets red, its temperature is measured and this value is given to red light. The higher the colour temperature is, the bluer the light will be, and vice versa, the lower the colour temperature is, the more red, yellow the light will be. When we talked about how the human eye sees light, we mentioned how the eye can adjust to the different changes which affect light colour. In someway, the human eye sees colours as they truly are. Remember that cameras register light colour if we use filters or the white balance function. Therefore, it is very important to know the colour temperature of the different types of light in our photographs. This way, we can correct or change the colour, or use it to achieve a personal touch. 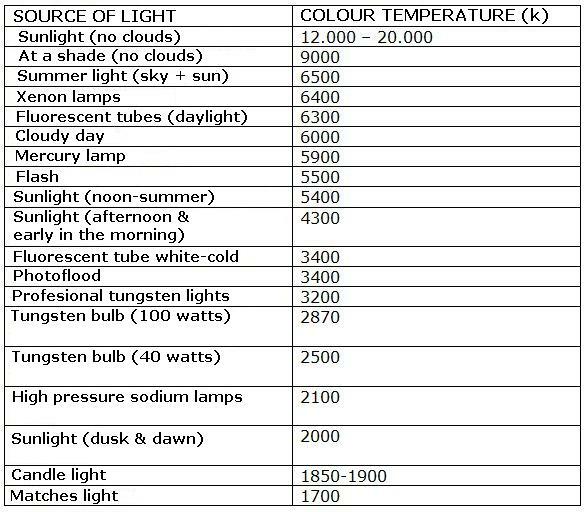 In the following chart, we have the colour temperature of different types of light sources.